00:02 Aniel Samaroo: In this episode, guys, we're going to talk about a question we get approached about a lot. When people are ready to start their online store, which eCommerce platform do we begin with? 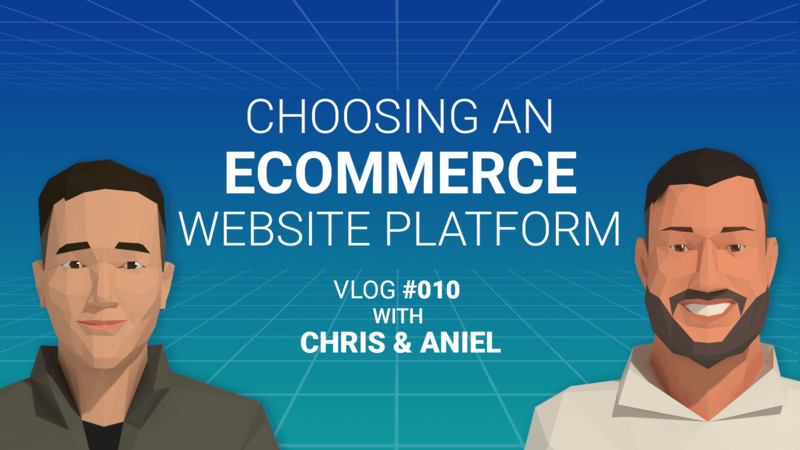 00:11 Chris Ching: So there's off the shelf platforms like Shopify and BigCommerce, which are SAAS, software as a service, and then there's also a platform like Craft Commerce, which you would self manage and self host and build your own design from the ground up. 00:24 Aniel Samaroo: So starting with the SAAS platform such as Shopify or BigCommerce, they're prepackaged solutions, for the most part. You start with templates. Shopify has over 100, BigCommerce is a little bit less. But you start with their templates and you go ahead and customize it to whatever you have depending on your product availability, or your listing, what are you offering. 00:42 Aniel Samaroo: It's relatively easy to get up and running because they already give you that starting point. 00:48 Chris Ching: Especially on the integration side, where most companies already have integrations set up with Shopify. If you're working fulfillment to email capture, CRM, most of those already have Shopify integrations, as well as BigCommerce. It's certainly on the rise. Not as popular as Shopify but they make it super easy to get those connections going so you don't have to customize that on your own. 01:22 Chris Ching: Yeah, I think $5000 for BigCommerce on enterprise level. So it does get up there but you're getting a much different service offering at that point. 01:30 Aniel Samaroo: So there goes that flexibility. But one thing to know with the SAAS platforms is that you're somewhat beholden to whatever they offer 'cause you're working within their platform. Everything's hosted by them, everything is managed by them. If you do want to customize a bit more, I think that's where you'd move into something independent like an opensource platform. 01:45 Chris Ching: Yeah, Craft Commerce, great platform, it's probably our preferred choice for eCommerce. The thing that we like about it the most is the content first approach. So optimizing your funnels, your conversion rates, rearranging landing pages. If I look at my tracking results and I see that people aren't getting to a certain depth of my funnel. Then it makes it easy for me to just kind of rearrange those elements on a page on the fly. 02:12 Chris Ching: The other thing is that we're not working with any templates so the design is going to be unique to your own brand goals as well as developing it, so you have to create that, essentially, on your own. So you'd be either working with an agency such as Electric Enjin, which is a official partner of Craft Commerce, or you would have to essentially just do the developments on your own. 02:33 Chris Ching: So obviously that means higher costs, although you don't have the monthly fees that you would have with Shopify and stuff like that. You would probably normally working with an agency to mange that. Craft Commerce is a $1000 licensing fee. That's a one time fee, and then on top of that you have a $99 annual recurring fee, and you definitely want to, you know, make sure that you are doing that because if you aren't getting those updates, then your site is all insecure and that's essentially the easiest way for a hacker to get into your site and gain entry to your data. 03:06 Aniel Samaroo: Both, two different customized solutions. And it's different for everybody. Each brand is going to have a preferred method. You could really try them both, try them all out and see what works best. But realistically, you want to be sure to what you're picking for your eCommerce platform 'cause you're dealing with customer data, you're dealing with ... there's a lot of private stuff in there, so you want to be able stay safe. 03:27 Chris Ching: Especially in this GDPR world. You've got to be very sensitive to where that data's being stored and making sure it's secure, otherwise you're going to have a lot of lawyers knocking on your door. 03:37 Aniel Samaroo: So this is us just touching ... this is really just the tip of the iceberg on both of these types of platforms. So check out our ... We have a blog post on this and we got a little bit deeper. But if you have any questions or just, you know, you want us to give a recommendation or even talk about it, feel free to leave something in the comments, message us, and we'll be happy to write back or let you know what's up. We'll catch you guys next time.